With Pipeliner, your process is visualized in a pipeline—which is divided up into stages that take an opportunity from lead to close, or an issue from start to finish. Opportunities are simply dragged and dropped from one stage to the next. The Pipeline View in Pipeliner shows how an aspect of your financial services organization or bank is performing, and how it is likely to perform in the future. Pipeliner puts this information front and center like no other system. Because every bank or firm has its own unique processes, Pipeliner is designed so that it is instantly customizable to a company’s processes. 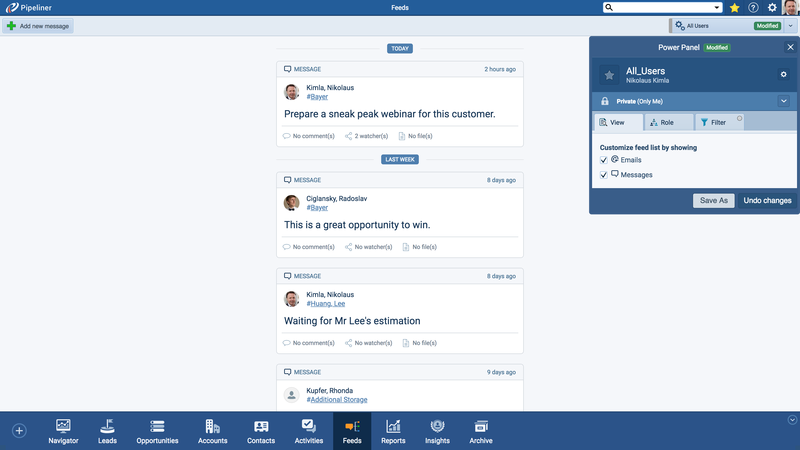 Since a company is a dynamic entity and processes are likely to change over time, changing a process within Pipeliner is as easy as creating it in the first place. 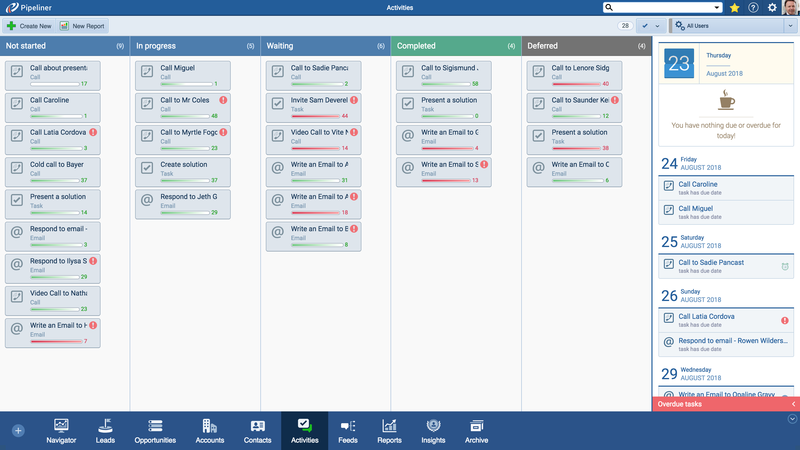 Because a bank or financial services company is going to have more than one process, Pipeliner allows you to have as many processes as you need. All are connected to the same database, so that opportunities or issues can be moved from one process to another, with all data intact. In addition to the stages of a process all instantly visible in the Pipeline View, the Dynamic Target is also always visible, on the right-hand side. The target displays the current state of the target, given all opportunities within the pipeline. The target can also be customized for any numeric figure so that it will show potential results for any process. Within each stage, activities and tasks can be set so that agents are guided by best practices through every stage. 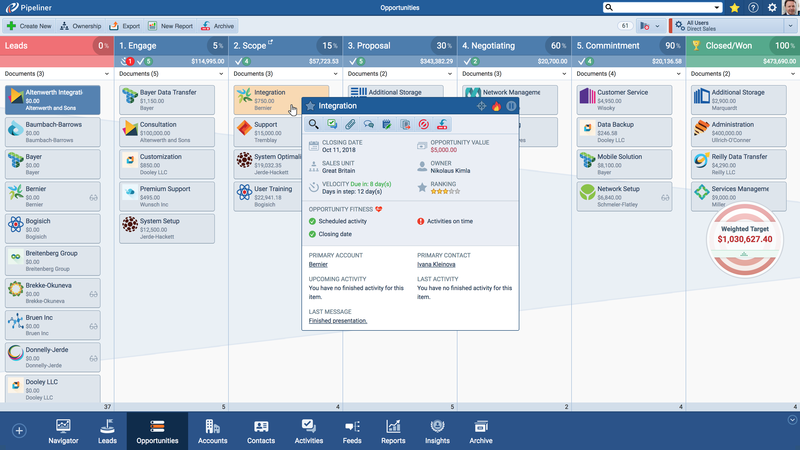 Tasks can also be automatically set up so that they appear for an opportunity as it is moved from one stage to the next. The Pipeliner Archive is where all lost opportunities or closed accounts are kept so that they can also be analyzed against their process. All data—the same data present when the opportunity was “live”—is available. If the opportunity comes back to life again, it’s a matter of 1 click to move it back to the current pipeline. As an additional view to the Pipeline View, Pipeliner now has a 3D Timeline View. You now have an instant view of all of your opportunities from 3 critical dimensions: stage, expected time to close and size of deal.